To see reviews, where to stay, photos, and more tourist information, read Rhodes Town holiday maker app . Uberlandia, Brazil to Rhodes Town is an approximately 27-hour flight. Due to the time zone difference, you'll lose 5 hours traveling from Uberlandia to Rhodes Town. Traveling from Uberlandia in June, plan for somewhat warmer nights in Rhodes Town, with lows around 25°C. Finish your sightseeing early on the 9th (Sun) to allow enough time to travel to Rethymnon. Kick off your visit on the 10th (Mon): look for gifts at Olive Wood Traditional Workshop, contemplate the long history of The Venetian Fortezza, then contemplate in the serene atmosphere at The Monastery Arsaniou, and finally take in the spiritual surroundings of Monastery of Arkadi. On the 11th (Tue), you'll have a packed day of sightseeing: delve into the distant past at Ancient Aptera, take an in-depth tour of Historical & Folklore Museum of Gavalochori, then take in the architecture and atmosphere at St. Nicholas Church, then explore the activities along Lake Kournas, and finally pause for some serene contemplation at Four Martyrs Church. Ask Inspirock to suggest an itinerary and make planning a trip to Rethymnon fast, fun, and easy. You can do a combination of flight and shuttle from Rhodes Town to Rethymnon in 4 hours. Another option is to do a combination of ferry and car. In June in Rethymnon, expect temperatures between 34°C during the day and 22°C at night. Cap off your sightseeing on the 11th (Tue) early enough to catch the ferry to Fira. Kick off your visit on the 12th (Wed): see the interesting displays at Wine Museum Koutsogiannopoulos, delve into the distant past at Ancient Thera, then explore the ancient world of Akrotiri, and finally make a trip to Akrotiri LightHouse. On your second day here, see the interesting displays at Museum of Prehistoric Thera, then do a tasting at Santo Winery, then shop like a local with Mnemossyne Gallery, and finally contemplate the waterfront views at Amoudi Bay. To see photos, other places to visit, more things to do, and tourist information, refer to the Fira visit planner . Traveling by ferry from Rethymnon to Fira takes 2.5 hours. Alternatively, you can drive; or do a combination of taxi and ferry. In June, plan for daily highs up to 32°C, and evening lows to 24°C. Cap off your sightseeing on the 13th (Thu) early enough to catch the ferry to Naxos. Start off your visit on the 14th (Fri): take a stroll through Kastro, delve into the distant past at Ancient Sanctuary at Flerio Water Spring, take in the exciting artwork at Fish & Olive, then see the interesting displays at Eggares Olive Press Museum, then delve into the distant past at Portara, and finally explore the ancient world of Temple of Apollo. Get ready for a full day of sightseeing on the next day: wander the streets of Old Town, then kick back and relax at Plaka Beach, and then tour the pleasant surroundings at Agios Prokopios Beach. For reviews, photos, traveler tips, and more tourist information, read our Naxos trip planner. Ride a ferry from Fira to Naxos in 1.5 hours. Alternatively, you can fly. June in Naxos sees daily highs of 32°C and lows of 24°C at night. Finish your sightseeing early on the 15th (Sat) to allow enough time to travel to Athens. 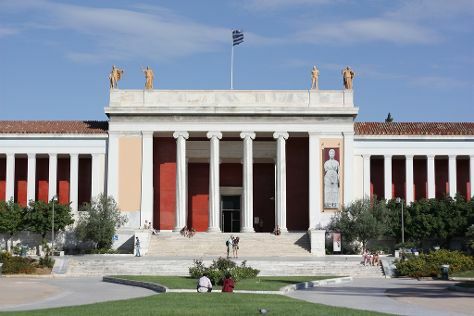 Kick off your visit on the 16th (Sun): get engrossed in the history at National Archaeological Museum, then see the interesting displays at Museum of Greek Popular Musical Instruments, then delve into the distant past at Temple of Olympian Zeus, and finally take an in-depth tour of Acropolis Museum. On the 17th (Mon), you'll have a packed day of sightseeing: take in the architecture and atmosphere at Church of Kapnikarea, then wander the streets of Plaka, then delve into the distant past at Erechtheion, and finally explore the ancient world of Acropolis of Athens. To find photos, other places to visit, ratings, and other tourist information, you can read our Athens trip itinerary planning tool . Traveling by combination of flight and subway from Naxos to Athens takes 2.5 hours. Alternatively, you can ride a ferry; or do a combination of ferry and bus. June in Athens sees daily highs of 35°C and lows of 24°C at night. Wrap up your sightseeing on the 17th (Mon) early enough to travel back home.